Hype, man. In the world of baseball, prospects are all the rage. Before one of these highly touted youngsters even step onto a major league field they are pumped up for what they “could be”. The hype is real and always appears to foreshadow their “ceiling” of what might be on the horizon. But we all know the hype sometimes has nothing to do with the reality. The reality can be a real downer, a window into mediocrity that could be stamped on them forever. The hype can be just as much a detriment as a saving grace for these players hoping to be the future of the game. Adalberto Mondesi knows all about that. Ever since he was signed in July of 2011 (stop and think about that for a moment . Over seven years ago.) there has been a constant expectation that he was bound to be a future All-Star. The hype was that Mondesi would be a five-tool player who has the sky within his grasp. Mondesi was always expected to be the future of the Kansas City Royals. But things have at the least taken a side road. Mondesi was called up in late July of 2016 and struggled. He hit .185/.231/.512 over 47 games while posting -0.3 bWAR. While defensively he appeared major league ready, offensively he still needed time to develop. That didn’t change last year, as he started the year as the Royals second baseman, hitting .170/.214/.245 over 25 games. He ended up demoted back to AAA Omaha while Whit Merrifield would step in and become the Royals best player. But something has finally clicked for Mondesi in 2018. Since the middle of August, Mondesi is hitting .313/.340/.542 over 14 games, hitting two home runs while driving in six. One of the most notable differences was in how hard he is hitting the ball this year. His hard hit rate has increased to 42.2% (up from 25.7% last year) and his exit velocity has hit 86.9%, up from 80.6%. Maybe the most glaring difference is the big uptick in launch angle, which is at 14.0 degrees, up from 4.2. Mondesi is doing what most other players have picked up on, which is elevating the ball to gain more success. So far, that strategy is working. The improvements by Mondesi really tell of a young player starting to find his way and opens up the door for a number of interesting questions. Maybe the most interesting was one posed on the Royals broadcast over the weekend. Royals broadcasters Ryan Lefebvre and Rex Hudler were discussing Mondesi and they made the comparison to Cleveland Indians star shortstop Francisco Lindor. Seems crazy, right? Ryan and Rex’s true intention was to compare Mondesi to Lindor athletically, not in the numbers. But their comment really stuck with me and it made me ask a bigger question: is it too far-fetched to think Mondesi could eventually be an elite player the caliber of Lindor? I figured we would start with a comparison of their minor league numbers. At AA, Lindor hit .280/.363/.390 over 478 plate appearances. Mondesi hit .248/.294/.393 over 469 plate appearances at AA. At AAA, Lindor hit .279/.333/.396 over 442 plate appearances while Mondesi hit .292/.328/.527 over 551 plate appearances. If you are calculating their entire minor league careers, Lindor hit .279/.354/.384 over 1880 plate appearances while Mondesi accumulated 2299 plate appearances and hit .258/.303/.410. The takeaway from these numbers is that Lindor was the better overall hitter in the minors, while Mondesi had a slight edge on the power numbers. There are a couple of notes here that we should remind every one of. First, Mondesi began his professional career at the age of 16, while Lindor was 17 years of age. It’s not a huge gap, but it does help explain the extra time Mondesi has spent in the minors compared to Lindor. It should also be pointed out that Lindor debuted with the Indians in 2015, during his age 21 season. Mondesi (not counting the World Series appearance in 2015) would officially debut in 2016, his age 20 season. That one year might not make a huge difference for some, but it did for Mondesi. At that point, he had only appeared in 14 AAA games while Lindor had 97 AAA games under his belt before his debut. It was long felt that the Royals had done a disservice to Mondesi by calling him up early, but he had been on a hot streak and the Royals were looking for a charge to spark their lineup. Instead Mondesi struggled and it’s taken almost two years to get to a point where he looks comfortable in the big leagues. With that in mind, I thought it might be more interesting to compare Lindor’s last stint in AAA and Mondesi’s just this season. Lindor hit .284/.350/.402 in 59 games at AAA before being recalled to the Indians in 2015. Mondesi was hitting .250/.295/.492 in 29 games before being recalled in June of this year. Once again, Lindor is the overall better hitter but the power numbers are comparable. To me, that is the biggest difference in their games. Lindor’s power numbers really broke out last year, his third year in the big leagues. In fact, his slugging percentage jumped from .435 in 2016 to .505 last season while his ISO (isolated power) jumped almost 100 points, from .134 to .232. Mondesi has also seen a big jump this year in his power numbers. His slugging percentage last year was .245 while this year it sits at .451, over 200 points higher. His ISO has also taken a leap, .075 to .179. Mondesi has done his damage in twice as many plate appearances as last year but has seen his numbers increase. Considering Mondesi is still a year younger than Lindor, it’s possible to see him continue to grow and improve on these numbers and while he might not quite reach the level of Lindor when it comes to power, he might not be as far off as you would expect at first glance. There is one more very noticeable difference and that is in their patience at the plate. Lindor has seen his numbers steadily climb throughout his major league career, going from 6.2% walk rate to this year’s 9.7%. Mondesi is not known for his patience, as noted by his 3.6% career walk rate. 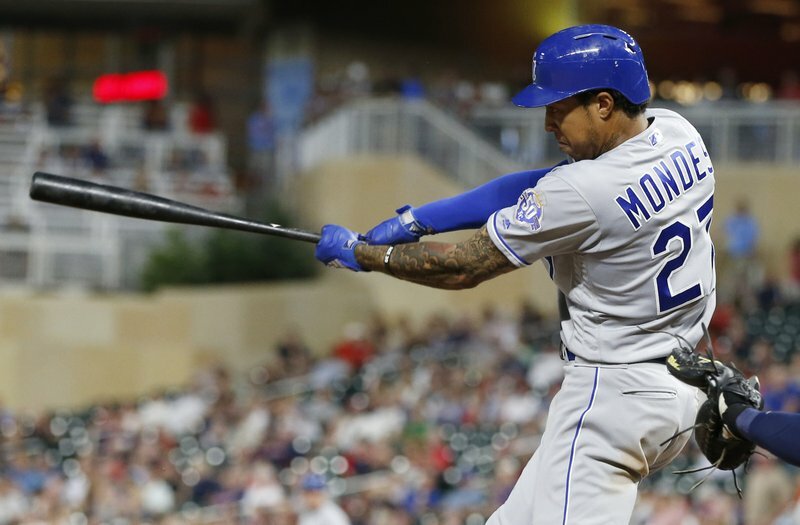 If Mondesi wants to continue to elevate his game, the first step is to improve his patience at the plate and swing at less pitches outside of the strike zone. Doing this should improve his numbers all the way around. It’s not hard to see how someone could compare Mondesi to Lindor: they are both middle infielders, with speed, play stellar defense and both switch hit. Athletically they are very similar. While on the surface it might seem crazy for Mondesi to soar as high as Lindor has these last two years, the numbers show that he appears to be on almost the same trajectory that Lindor took in his career. When you tack on that Mondesi has improved the longer he has been at each level of his professional career, it doesn’t take much squinting to see him being one of the top shortstops in the league alongside Lindor. While the initial projections spoke of him being a possible future All-Star, the reality spoke of a different story. Luckily for us Royals fans, reality is starting to catch up to all the hype. Hype, man.